Where Did the Dow Jones Industrial Average (DJIA) Close Today as Tech Stocks Drop? 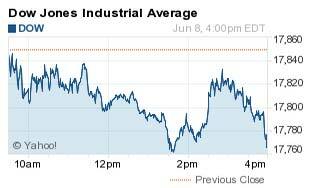 Subject: Where Did the Dow Jones Industrial Average (DJIA) Close Today as Tech Stocks Drop? The Dow Jones' close was roughly 82 points lower today as investors raised concerns over a possible interest-rate hike as soon as September and worries over Greece's debt problems cast a wide shadow over the European Union. Meanwhile, the U.S. dollar slid after reports indicated that U.S. President Barack Obama suggested a stronger dollar was bad for global growth. The White House denied the account, but the damage was largely done before clarification. The S&P 500 Volatility Index (VIX), the market's fear gauge, jumped more than 7.6% on the day. Stock Market News: Most economists are anticipating an interest rate increase by September, while the markets have priced in a small hike this year and another small one in early 2016. However, that still has many investors on edge about the central bank's plans. Today, eight of the 10 major S&P sectors were in the red, with the technology index hit the hardest with a 1.2% decline. Major tech components like Microsoft Corp. (Nasdaq: MSFT), Oracle Corp. (NYSE: ORCL), Google Inc. (Nasdaq: GOOG, GOOGL) were all off on the day. The Biggest Losers: The airlines sector slipped more than 4% today on news that Qatar Airways has asked the industry's largest trade group to address issues related to protectionism. According to Qatar Airways, the United States is restricting domestic market access to Gulf carriers. Shares of JetBlue Airways Corp. (Nasdaq: JBLU) were hit hardest, falling 7.2% on the day. Shares of American Airlines Group Inc. (Nasdaq: AAL), Delta Air Lines Inc. (NYSE: DAL), and United Continental Holdings Inc. (NYSE: UAL) all fell more than 4.2% on the day. On Tap This Week: On Tuesday, a busy day of market data includes a report by the U.S. Commerce Department on April wholesale inventories, which economists expect to have increased by 0.2%. The U.S. Labor Department will also release the job openings and labor turnover (JOLTS) report. Companies reporting earnings tomorrow include Burlington Stores Inc. (NYSE: BURL), Ferrellgas Partners LP (NYSE: FGP), Lululemon Athletica Inc. (Nasdaq: LULU), and Organovo Holdings Inc. (NYSE: ONVO). Stocks to Watch No. 1, DB: Shares of German investment giant Deutsche Bank AG (NYSE: DB) jumped more than 5% on news that its co-chief executives were stepping down. The company's top job will now go to former UBS Group AG (USA) (NYSE: UBS) Chief Financial Officer John Cryan. Stocks to Watch No. 2, AAPL: Shares of Apple Inc. (Nasdaq: AAPL) retreated 0.66% as the company kicks off its annual Worldwide Developers Conference (WWDC) in San Francisco. Today, the company announced the pending release of its own online streaming music service to compete with rivals like Pandora Inc. (Nasdaq: P) and com Inc. (Nasdaq: AMZN). Pandora shares dropped more than 3.7% on the news. Among the many other announcements expected, the firm will likely release a new tool kit that allows developers to create application for its new Apple Watch. Shares were on the decline on news that the smartphone industry is showing slight weakness, even though the firm has built broader market share. Stocks to Watch No. 3, TSLA: Shares of Tesla Motor Co. (Nasdaq: TSLA) were up more than 2.8% on news that Panasonic would begin sending employees to the battery manufacturer's new Gigafactory when manufacturing begins in 2016. Stocks to Watch No. 4, LULU: Shares of Canadian yogawear retailer Lululemon Athletica Inc. (Nasdaq: LULU) slipped more than 3.5% ahead of tomorrow's quarterly earnings report. Wall Street analysts expect the company to report first-quarter per-share earnings of $0.33. The firm has warned of a weakened report due to West Coast port delays, poor winter weather, and a stronger U.S. dollar. Stocks to Watch No. 5, SHLD: Shares of Sears Holdings Corp. (Nasdaq: SHLD) slipped 4.25% on Monday after the company reported a near-11% decline in same-store sales over the first quarter. Sales at its Kmart locations also fell 7%, as the retailer saw many similar pressures of its rivals in the first quarter. The company will launch a spinoff of more than 200 stores into a real-estate investment trust (REIT) later this week, although today's report could raise concerns for new investors.